Energy in France is the energy and electricity production, consumption and import in France. Bottom: The Cruas nuclear power plant at night. The electricity sector in France is dominated by nuclear power, which accounted for 72.3% of total production in 2016, while renewables and fossil fuels accounted for 17.8% and 8.6%, respectively. France has the largest share of nuclear electricity in the world. The country is also among the world's biggest net exporters of electricity. The French nuclear power sector is almost entirely owned by the French government and the degree of the government subsidy is difficult to ascertain because of a lack of transparency. Électricité de France (EDF) is the main electricity generation and distribution company in France. It was founded on April 8, 1946 as a result of the nationalisation of a number of electricity producers, transporters and distributors by the Communist Minister of Industrial Production Marcel Paul. Until November 19, 2004 it was a government corporation, but it is now a limited-liability corporation under private law (société anonyme). The French government partially floated shares of the company on the Paris Stock Exchange in November 2005, although it retains almost 85% ownership as of the end of 2007. EDF held a monopoly in the distribution, but not the production, of electricity in France until 1999, when the first European Union directive to harmonize regulation of electricity markets was implemented. A report was published in 2011 by the World Energy Council in association with Oliver Wyman, entitled Policies for the future: 2011 Assessment of country energy and climate policies, which ranks country performance according to an energy sustainability index. The best performers were Switzerland, Sweden, and France. Wikimedia Commons has media related to Renewable energy in France. Piper Jaffray expected strong growth in France in 2009 and 2010, partly because of an expected decline in the price of solar panels and partly because of subsidies introduced in 2006 making themselves felt. France should be a key driver for solar together with Italy during 2009-2010. Piper Jaffray believes that France would add 500 megawatts of capacity in both 2009 and 2010. France has 50 megawatts of solar power capacity now. Hydroelectric dams in France include Eguzon dam, Étang de Soulcem, and Lac de Vouglans. In July 2015, the French parliament passed a comprehensive energy and climate law that includes a mandatory renewable energy target requiring 40% of national electricity production to come from renewable sources by 2030. For context, 19.5% of the country's electricity was generated by renewable energy in 2014 (13.8% hydro, 3.5% wind, 1.2% solar, 1.0% others). Wikimedia Commons has media related to Energy in France. ^ National yearly power generation by source, Réseau de Transport d'Électricité (Electricity Transmission Network Company) Open Data. ^ Bennhold, Katrin (21 November 2005). "EDF shares fail to light up market". International Herald Tribune. Retrieved 2008-07-11. ^ "Shareholding policy". Électricité de France. 31 December 2007. Retrieved 2008-07-11. ^ Tara Patel (2015-07-22). "France to Adopt Law to Cut Nuclear Dependency, Carbon Emissions". Bloomberg News. Retrieved 2015-07-23. ^ "France passes sweeping energy bill, to raise CO2 tax to €100/t by 2030". Carbon Pulse. 2015-07-22. Retrieved 2015-07-23. ^ "France Electricity Report for 2014" (PDF). Réseau de Transport d'Électricité. 2015-01-27. Retrieved 2015-07-23. Électricité de France S.A. is a French electric utility company, largely owned by the French state. Headquartered in Paris, with €71.2 billion in revenues in 2016, EDF operates a diverse portfolio of 120+ gigawatts of generation capacity in Europe, South America, North America, Asia, the Middle East and Africa. The share of energy from renewable sources in gross final consumption of energy continued rising to reach 17% in the European Union in 2016, a doubling of the share attained in 2004 at just 8.5%. The Europe 2020 strategy includes a target of reaching 20% of energy in gross final consumption of energy from renewable sources by 2020 and at least 27% by 2030. These figures are based on energy use in all its forms across all three main sectors, the heating and cooling sector, the electricity sector and the transport sector. World energy consumption is the total energy used by the entire human civilization. Typically measured per year, it involves all energy harnessed from every energy source applied towards humanity's endeavours across every single industrial and technological sector, across every country. It does not include energy from food, and the extent to which direct biomass burning has been accounted for is poorly documented. Being the power source metric of civilization, World Energy Consumption has deep implications for humanity's socio-economic-political sphere. Germany has been called "the world's first major renewable energy economy". Renewable energy in Germany is mainly based on wind, solar and biomass. Germany had the world's largest photovoltaic installed capacity until 2014, and as of 2016, it is third with 40 GW. It is also the world's third country by installed wind power capacity, at 50 GW, and second for offshore wind, with over 4 GW. Fossil fuel phase out refers to the discontinuation of the use of fossil fuels, through the decommissioning of operating fossil fuel-fired power plants, the prevention of the construction of new ones, and the use of alternative energy to replace the role of fossil fuels. The energy sector in Switzerland is, by its structure and its importance, typical of a developed country. Apart from the hydro and biomass, the country has few indigenous energy resources: petroleum, gas and nuclear fuel are imported, so that in 2006 only 15% of final requirements have been covered by local resources. The electricity sector in France is dominated by nuclear power, which accounted for 72.3% of total production in 2016, while renewables and fossil fuels accounted for 17.8% and 8.6%, respectively. France has the largest share of nuclear electricity in the world. France's electrical grid is part of the Synchronous grid of Continental Europe and it is among the world's biggest net exporters of electricity. 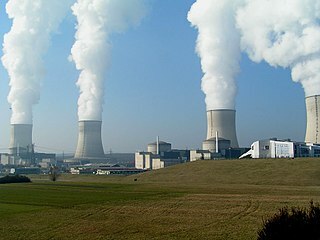 The French nuclear power sector is almost entirely owned by the French government and the degree of the government subsidy is difficult to ascertain because of a lack of transparency. Solar power in France including overseas territories reached an installed capacity figure of 7,165 MW by year end 2016 generating 8,790 GWh of power. Solar power in Mexico has the potential to produce vast amounts of energy. 70% of the country has an insolation of greater than 4.5 kWh/m²/day. Using 15% efficient photovoltaics, a square 25 km (16 mi) on each side in the state of Chihuahua or the Sonoran Desert could supply all of Mexico's electricity. Solar power in Switzerland has been growing rapidly in recent years due to declining system costs and a feed-in tariff instituted by the Swiss government. In 2013, cumulative capacity increased by 69% to 730 megawatts (MW) and contributed 544 GWh or 0.8% of the countries net-electricity production. Under the Renewable Energy Directive Ireland has set a target of producing 16% of all its energy needs from renewable energy sources by 2020. Between 2005 and 2014 the percentage of energy from renewable energy sources grew from just 3.1% to 8.6% of total final consumption. By 2020 Ireland has a target of producing 42.5% of its electricity needs from renewable sources.